Does your club want a course? Does your club want to run a course? Have you members in the club who wish to take part in a course?. 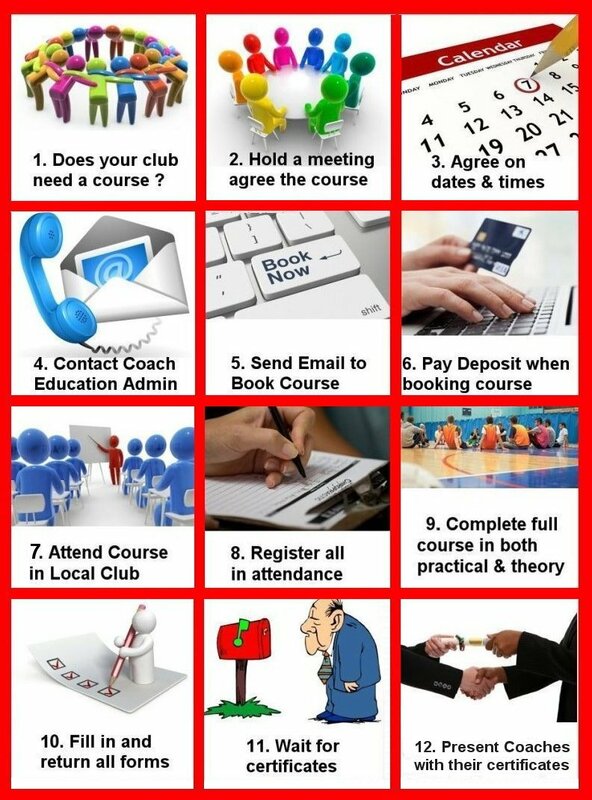 These are the steps for clubs to book a course. Árd Chomhairle has approved the following standards for Inter-County and Club teams. By the start of the 2018 season, all Inter-County head coaches will be Award 2 qualified. By the start of the 2018 season all club head coaches will be Award 1 qualified. The following initiatives have been prioritised to support the roll out of these standards across the Association. The delivery mechanisms for the GAA Coach Education Programme to be expanded to include Online (learning.gaa.ie), Communities of Practice and Mentoring. Recognition of relevant competencies gained through non-GAA programmes or internal programmes, currently not formally linked to the GAA Coach Education Programme, will be facilitated and quality assured. An assimilation programme will be established to recognise the competencies of managers and coaches who have gained experience and expertise without gaining GAA CEP qualifications to date. If you or your club wish to avail of the Coaching courses being provided please read the information on the website first before contacting Coach Education Officer Shane Supple at shane.supple.gda.cork@gaa.ie. You must meet the criteria involved in each step as you go along, however if you do not hold a Foundation Certificate you can still help out in your local club, but you must have Garda vetting completed and you must complete the Child Welfare & Protection course in your club. It is recommended that you complete the Foundation Course to help give you a better understanding of coaching young players, again this is only a recommendation, but club Guidelines must be adhered to. If your not sure check with your club Coaching Officer. The recommended steps to your coaching pathway. Child Welfare & Protection Course.